Inez Davis runs the little post office in Lone Mountain and lives in the old store building that houses it. LONE MOUNTAIN, Tenn. - Life is changing in Claiborne County. On Lone Mountain and in the valley, a new golf course has eaten up the hills where farms once flourished. Now the trees are down and new houses are popping up like mushrooms after a good rain. There has been an influx of new immigrants. What somesee as progress, locals who have lived here all their lives see as the destruction of tradition, history and a simple but fulfilling way of life. Old-timers are worried, and for good reason. One of their favorite gathering places, the community post office, run by Inez Davis out of her Lone Mountain Store south of Tazewell on Lone Mountain Road, may be threatened with extinction. There is no official notice, yet, but those in the community are apprehensive. Word has filtered back to them that the U.S. Postal Service in Nashville is "reviewing" its statewide smaller operations, and some of the tiny outposts may be vulnerable. The post office occupying a corner in Inez Davis' store fits the description of a small operation, but it's a big concern for the community. Even though Davis has been warned not to bring attention to her little post office, she and others in the community have started a petition of concern, just in case the Postal Service sends in official representatives to shut them down. If that happens, Lone Mountain will have lost something far more important than just a community place to mail and to get letters from the outside: It is one of the last vestiges of their past. Once, Lone Mountain throbbed with life: There was the Payne Brothers three-story brick store that carried everything needed to get you from the cradle to the grave. There was a barbershop, a blacksmith shop, a saddle shop, a one-room jail, a restaurant and the Southern Railway train depot. The Payne boys also ran a car shop, where they assembled Model T Fords that were brought in by rail from Michigan and unloaded in boxes at the depot, just behind where Davis' store now sits. "The flavor of Lone Mountain," says John Jennings Kivett, county historian, "is in its characters. Lone Mountain is a place that just had characters, and they all had nicknames. It is a different place on this earth." Davis' store wasn't there at the time of the railhead depot, but a number of other buildings were. Two residents who remember the old days in Lone Mountain are Athene Lane Roberts, who will be 75 this month, and Anne Cabbage, 85. (That's the "Two B" Cabbages, she says.) Both were born in Lone Mountain and have lived there their entire lives. Former post office operator Athene Lane Roberts leaves the Lone Mountain Grocery Store. Roberts started Lone Mountain Store with her husband, Frank Lane, in 1949. She sold out in the 1980s and eventually Davis took it over. Lane had been the postmaster for nearly 40 years and when he died, Roberts operated the post office for almost 10 more years, until she retired in the 1980s. That's when the little post office became a community contract affair, run out of one corner in the Lone Mountain Store. "Frank was the postmaster when this was a fourth-class office," says Roberts proudly. "He was a schoolteacher until he got into the store business and took over the post office in the Rock Building." That would be the old building across the street that once served as a funeral home. You couldn't get embalmed there, but you could purchase a casket for a quick burial. "Frank was commissioned postmaster in 1935. The post office had been in the Payne Brothers store before I was born," says Roberts. "Let's see," she says, "then Eliza Miller was postmaster before Frank." Cabbage has to pick up the story from here. Her age makes her something of a community historian. Anne Cabbage, 85, said, "I'm old enough to be an unchained blessing." "You know, I'm old enough to be an unchained blessing," she says as she opens the front door to her home. Outside, the weather is snowy and icy. Inside, the house is warm as a pile of blankets. "When you get to be 85 years old, everything is historical," Cabbage, a former schoolteacher, says. "Let's see, now. Before Eliza, there was John Yoakum and Joe Rose. John was the postmaster. My grandfather, Royal Jennings, who lived to be 87, worked for John. 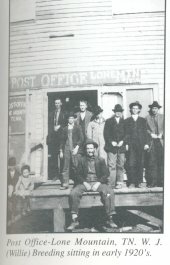 He carried the mail to Long Bottom, Taz Branch, and up in the country toward Hancock County. He said there was only one (mail carrier) route then. "I recall the carrier had saddlebags. They'd toss the bags across the horse. The mail would come to us by train. Everything came to us by train." Roberts nods her head to agree and fills in a little more Lone Mountain lore. "We serviced Union, Claiborne, Grainger and Hancock counties with the train," she says. "They'd bring all their goods here and ship them out to New York. I remember the time they would herd their turkeys here. The birds would roost in the trees at night, and they'd entice them down the next morning with food. Then Edgar Jennings would take them to New York and sell them. He'd sell eggs in New York, as well. "Back then, we were bigger than New Tazewell." she says. "The train would take the sick by stretcher to hospitals in Knoxville. People ordered goods by catalogs," Cabbage adds. "The train does stop here sometimes," Davis puts in. "They stop and the men get sandwiches with me." A bologna sandwich with cheese sells for $1.10. A thick slice sells for $1.25. The auto assembling "plant," the restaurant, saddle and blacksmith shop, funeral store, train depot and a host of other buildings are gone today. Only Davis' store remains. Inside, the community post office anchors one corner with its 130 postal boxes, only 63 of which are in use. Each morning, the mail is delivered to the store by 10:30 a.m. and goes out to Tazewell. Postal customers arrive at all hours, from the time the post office opens at 7:45 a.m., until it closes at 5:15 p.m. It is open even on Saturday, says Davis, who also lives in a small apartment in the store. "Why, this post office must be 140 to 150 years old," says Cabbage. "This place looked like an old western town then with its wooden buildings. Until it burned down. The post office is the last of our heritage." "It means everything to us," she said. "Congressman John Duncan (Sr.) helped us once before in the 1980s when it looked like they would close us. We need help now. I've called his son," U.S. Rep. John Duncan Jr. R-Knoxville. "One day, I got a call from John Duncan. I said, 'Oh, Lord, it's John Duncan. You will have to wait until I get a-hold of myself. In all my years, I never had a congressman call me,' " Cabbage said. The two women of Lone Mountain hope they don't have to call their congressmen again. They want some things to stay as they are now, progress or no progress. If required, however, they stand prepared to call anyone and everyone to save their post office, should that become necessary. After all, they do recall the days of "ringing up," when the entire community was on a 20-phone party line. If it comes down to it, they will ring up once again. Copyright 2003, KnoxNews. All Rights Reserved. The following was sent from my 90 year old Uncle who lived in Lone Mountain, his father, my grandfather started the Payne Bros. Store. 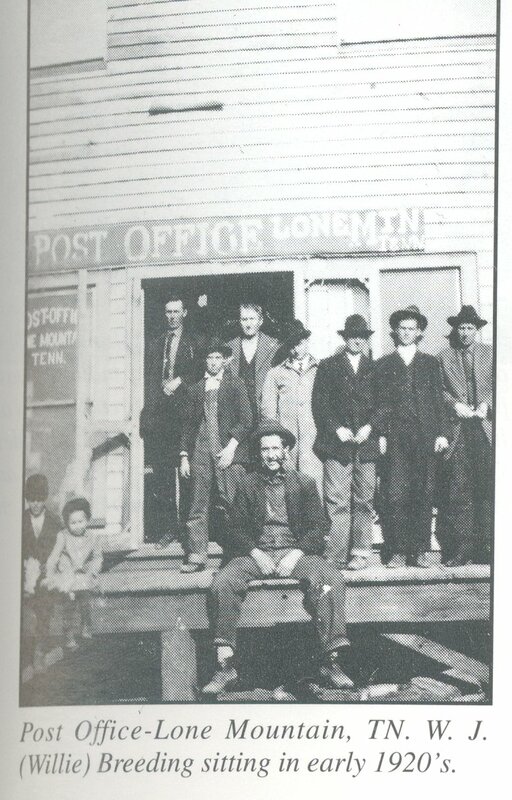 The Lone Mountain Store and Post Office has long been a part of the community outside Tazewell. License plates on the wall date back to the 1950's, but the store's history goes back much further. "Well over 170 something, probably closer to 200 (years). A long time, a long time," owner Inez Davis said. Davis bought the store in 1990. All sorts of products have filled the shelves during that time. "Everything, just about, that could be thought of," she said. "Even at one time we had some clothing; a general store, little bit of everything." Saturday marks the final time the sign in the window will say "open". Business slowed so much Davis had to close the store December 31st. Starting Monday, mail will no longer be delivered to the post office. The community successfully petitioned to keep it open in 2003. This time there was no such luck. "Its just one of those things, we can't stop this time. It's a done thing," Davis said. Current P.O. Box customers can keep their box number and zip code, they'll just have to drive to the New Tazewell Post Office to pick up their mail. "It's going to cause some of them to drive farther, a few have put up boxes on the route to get it so it will be closer and not so inconvenient. Some are going to go on because they're afraid for their mail to be in a box on the route," Davis said. She says she is sad to close the doors, but remains optimistic about the future. "It's going to be different, but everything has a reason. There will be something down the way," Davis said. The building is currently up for sale. Davis is considering going back to school and starting a new career.